Professionals in the customer service industry know how complicated people can get—some are delightful, some are moody, some are grumpy, and so on. This is where knowledge of psychology principles comes in handy. At their core, business and psychology both explore a better understanding of people’s behavior, wants, and needs. Of course, customer service ties both fields together, as providing a top-notch customer service experience is the key to acquiring and retaining new and existing customers. 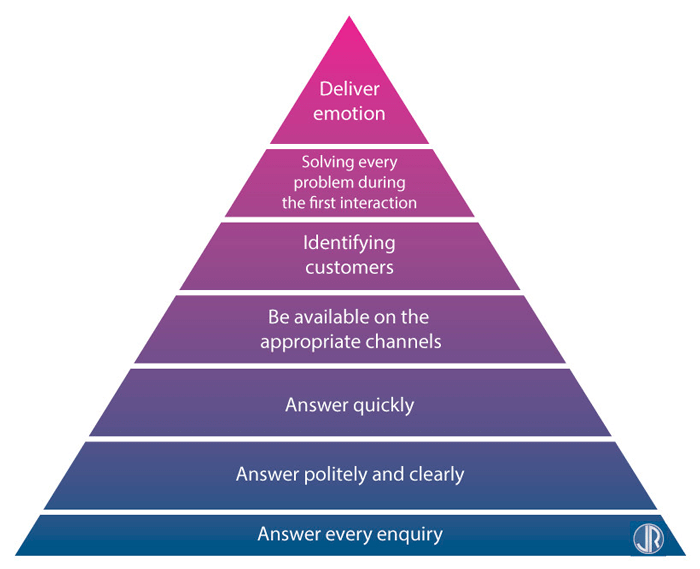 Here are a few ways you can leverage psychology to deliver the best customer support. Let’s start with the fundamentals. Maslow’s hierarchy of needs is as follows (from the bottom to top): physiological, safety and security, love or belongingness, self-esteem, and self-actualization. This motivational theory in psychology shows that human beings must fulfill their bottom-tier needs before they can attend to higher-tier needs. While empathy, kindness, and politeness are key to providing excellent customer support, your customers will not be able to appreciate it without you first resolving their tangible issues. As such, customer service representatives must first address all basic problems before advancing to more complex issues and ultimately making the customer happy. Freud was right about the pleasure principle—humans are hardwired to seek instant gratification for their urges and wants. If things don’t turn out the way they want it to, they would feel down. As customer service professionals, you want to keep your customers from feeling that way. You can help your existing and potential customers reach out to you fast and easy with instant chat features or social media. This not only makes your customers feel grateful for the immediate attention, but it also keeps the customer on your site longer (which can generate leads). People are most likely to remember the first and last thing they hear. The halo effect is a cognitive bias where the brain allows positive traits to influence one’s assessment of a brand and its entirety. It’s your goal to create a positive experience for your customers to have a remarkably positive impression of your company. When a client reaches out to customer service for the first time, their initial opinion will shape their entire perception of your brand. Ultimately, this perception will influence whether they’ll stay loyal to your brand, refer your products and services to other people, or choose your competitor instead of you. It’s human nature for people to give back when they receive something they like. Reciprocity is a common yet underestimated concept in the customer service field. This has two types: trumpeted reciprocity, when the receiver knows and expects to receive something; and surprise reciprocity when you give them something they didn’t expect. Customers expect brands to resolve issues they may have with the products and services they paid for. It’s common sense. But, when you give them more than they’re expecting and they feel like you extended your services to ensure their satisfaction, then they will deem it a favor they must return, whether that’s in the form of positive testimonials, reviews, or client referrals. As a customer support staff, dealing with all kinds of people with different backgrounds, mindsets, and problems comes with the job. Whatever behavioral peculiarities or emotional state they’re in, it’s your responsibility to do the best you can to understand them—look at every angle possible so you can provide the best solution for them.